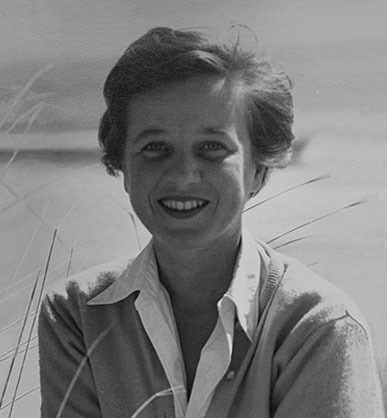 Jill Elgin was the pen name of Kathleen Josephine Elgin, born January 13, 1923 in Princeton, New Jersey. Her father, Charles Porter Elgin, was born in 1897 in Columbus, Ohio. Her mother, Mary Leantine Poore, was born in 1897 in Ohio. Her parents married on August 1, 1919. The father was a graduate student in the Department of Electrical Engineering at Princeton University. In 1923 the father graduated with a Masters Degree in Electrical Engineering from Princeton, after which he was hired as a consultant for the New York Telephone Company. In 1924 he was hired as a consultant for the Ohio Bell Telephone Company in his home town, Columbus, Ohio, so the family moved to Columbus. 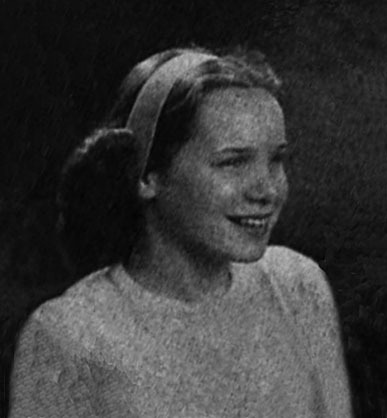 In 1925 her sister, Susanne Elgin, was born. Two years later the youngest sister, Charlene Elgin, was born. In 1931 the father bought the Cedarville Ohio Dolomite Company, so the family moved to Cedarville. By 1932 the three daughters were attending public school in Xenia, Ohio, so the family moved to 241 North King Street in Xenia. 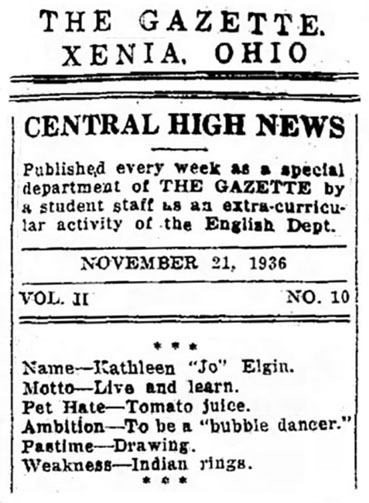 On November 21, 1936 the student newspaper published a brief profile on Kathleen Jo Elgin, in which she said her favorite activity was "drawing" and her career choice would most likely be "bubble dancer." 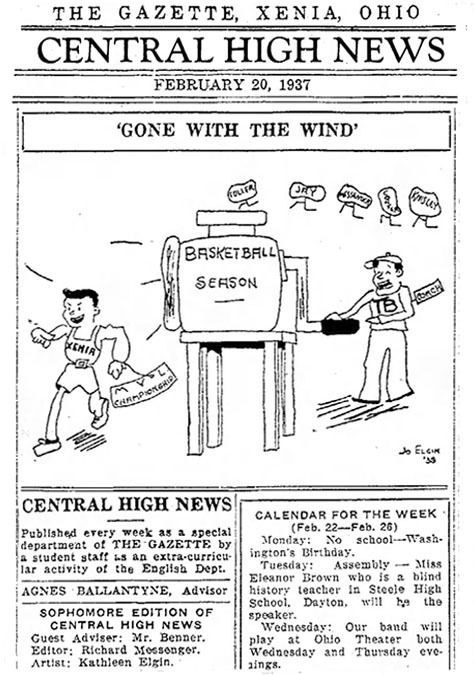 In 1937 Kathleen Jo Elgin drew a comic strip for the student newspaper, which was published every Saturday in the local newspaper, The Xenia Gazette. 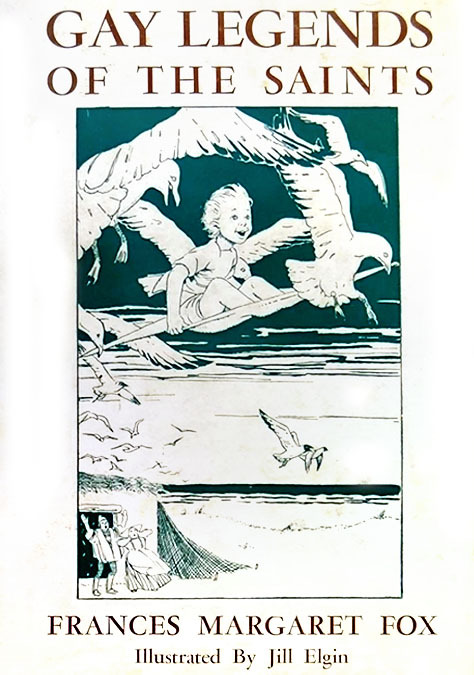 The young artist signed her comic strip "Jo Elgin." 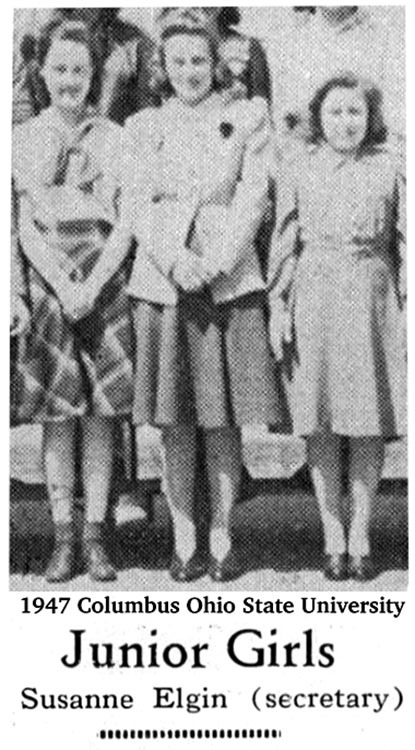 In June of 1939 Kathleen Jo Elgin graduated from Xenia High School. In September of 1940, at the age of seventeen, she moved to Dayton, Ohio, to study art at the Dayton Art Institute. She lived at 125 West First Street. In 1940 the U.S. government began to require draft registration for all able-bodied men over the age of 18. War was declared after the Japanese attacked Pearl Harbor on December 7, 1941, and the nation mobilized for victory. Kathleen Jo Elgin's father, Charles Porter Elgin, who was a veteran of the Great War, re-enlisted at the age of forty-four. He served as a Major in the Air Force, and was was stationed at the engineering department of the Lindly Aviation Company of Mineola on Long Island, New York. Mrs. Elgin and her three daughters left Xenia, Ohio, and moved to Hampton Bays, Long Island, NY. In 1942 Kathleen Jo Elgin left Hampton Bays and moved to New York City to attend night classes at the National Academy of Design at 1083 Fifth Avenue at 89th Street. She lived at The Ansonia Hotel, a grandiose apartment complex at 2109 Broadway, between 73rd and 74th Streets, on the Upper West Side. At first she supported herself by doing freelance commercial art for advertising agencies, but as money ran low she began to look for steady work as a staff artist. 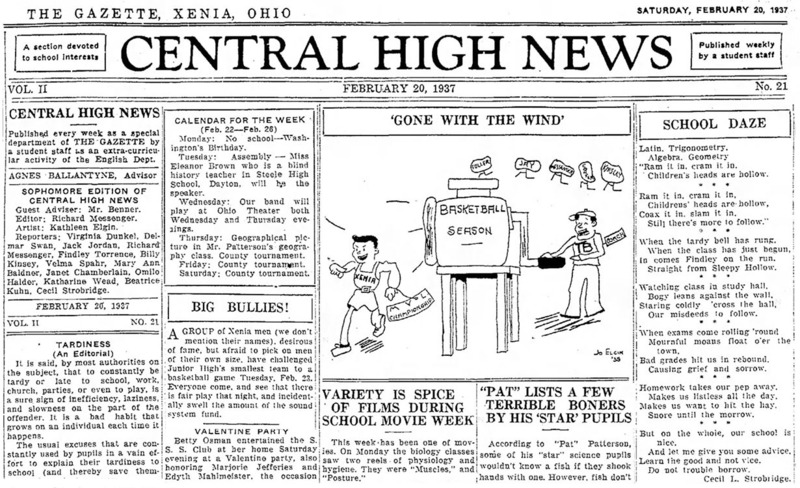 She visited NYC publishing companies with her portfolio, which featured her first published work - the high school comic strip, signed "Jo Elgin," that had appeared in The Xenia Gazette. 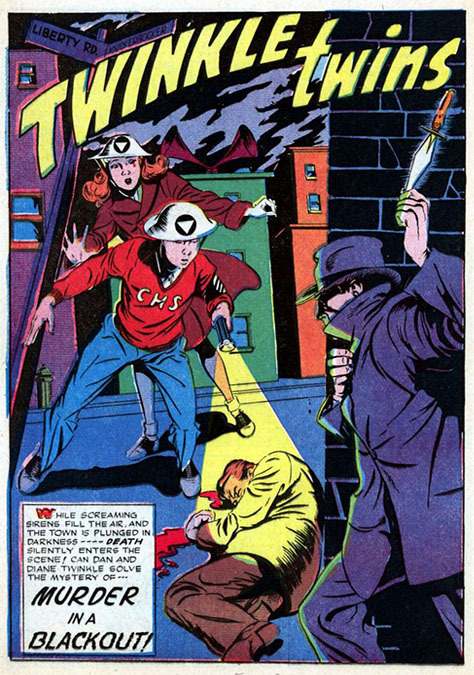 Her first full time employer was Everett "Busy" Arnold at Quality Comics, where she worked as a staff artist under the name "Jo Elgin." She inked "Kid Eternity" for Quality Comics. 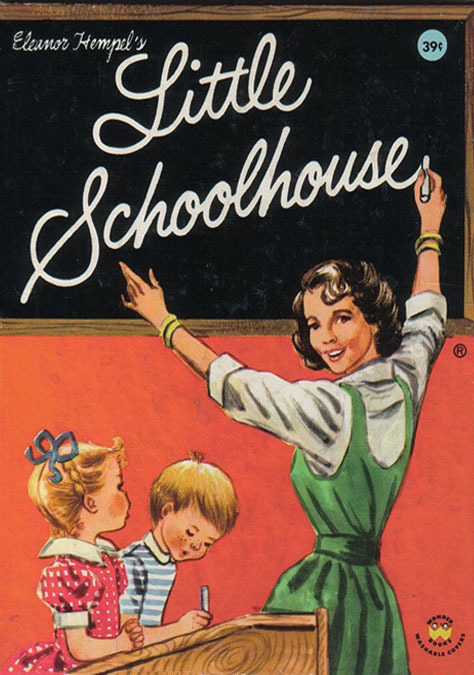 In 1941 she drew various features for Parents' Magazine Press. Her work appeared in True Comics, Calling All Girls, and Real Heroes. In 1942 she was commissioned to illustrate "Gay Legends of the Saints" by Frances Fox for Sheed & Ward Publishing Company. This was a children's book on a Catholic theme. The Elgin family was not Catholic, and Kathleen Jo Elgin identified herself as an atheist. This was the first project she signed with the pen-name, "Jill Elgin." 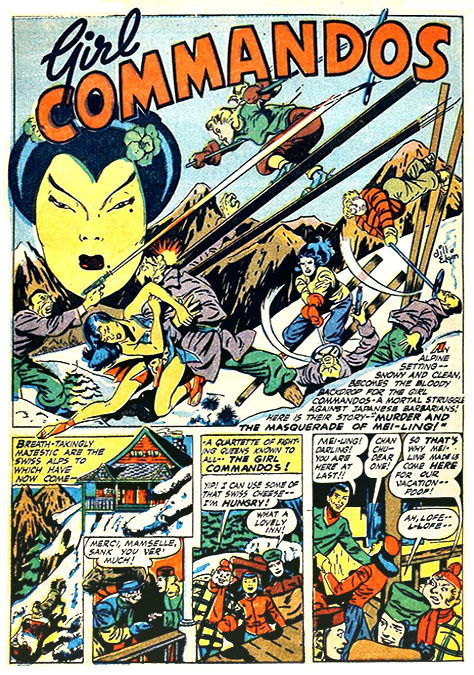 In 1942 she worked for Harvey Comics, where she wrote and drew "Girl Commandos" which appeared in Speed Comics. She again used the pen-name "Jill Elgin." 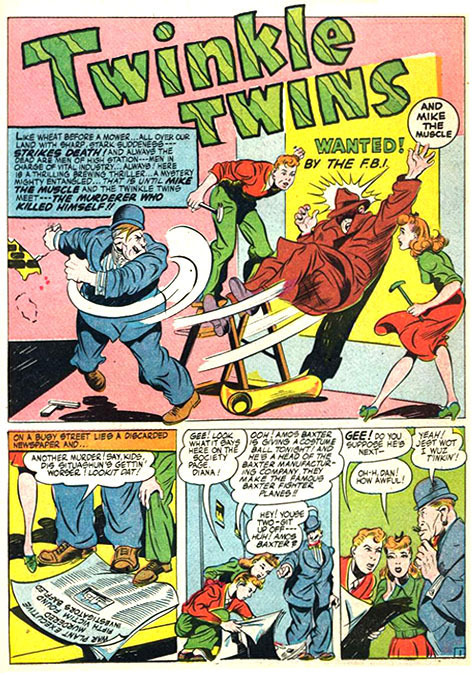 She also drew for Funnies Incorporated, headed by Lloyd Jacquet. 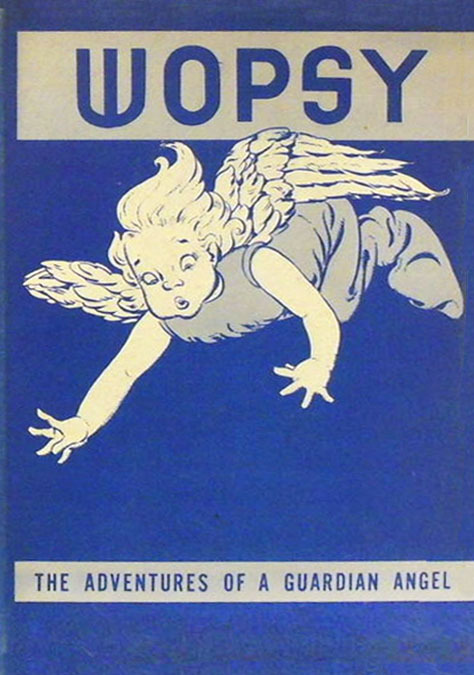 In 1945 Kathleen Elgin illustrated a second children's book of a Catholic theme, "Wopsy, The Guardian Angel," by G. Scriven for the Cathetical Guild. She again used the pen-name "Jill Elgin." After the war, the Elgin family continued to live in Hampton Bays, on Long Island, NY. In 1948 her sister, Susanne Elgin, married Dieter Cosman, and moved to Huntington, Long Island, NY. In 1952 her sister, Charlene Elgin, married Joseph Allen White, Jr., and moved to Stamford, Connecticut. 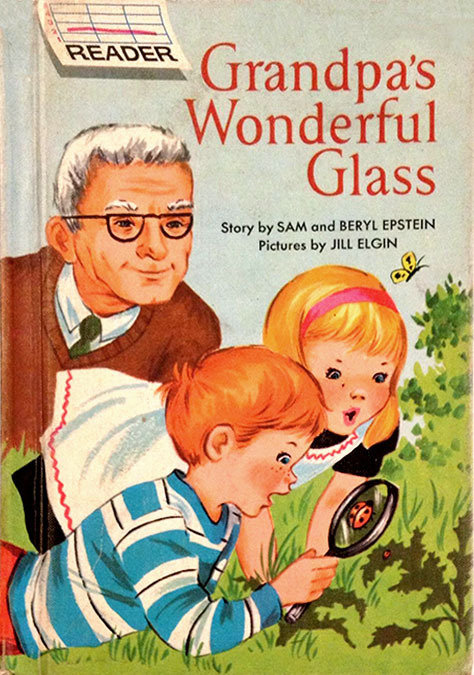 In 1950 Kathleen Elgin illustrated the children's book, "Big and Little, Up and Down" by E. Berkley. This was the first project she signed "Kathleen Elgin." She went on to write and illustrate dozens of books for the young adult readers. 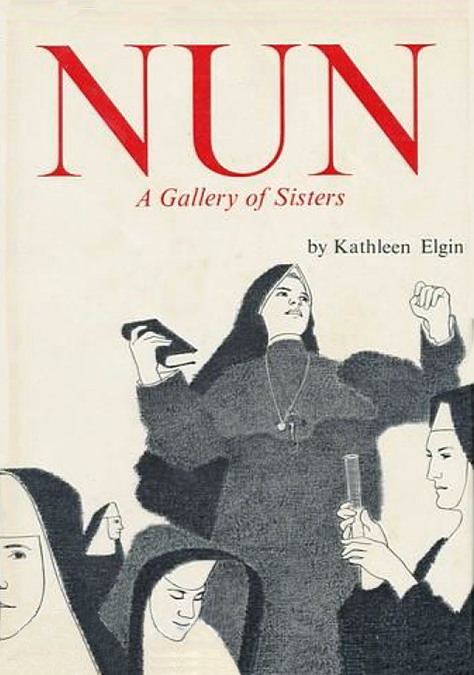 Titles that were written and illustrated by Kathleen Elgin include, "The First Book Of Myths" (1957), "The First Book Of Norse Legends" (1957), and "Nun" (1965). 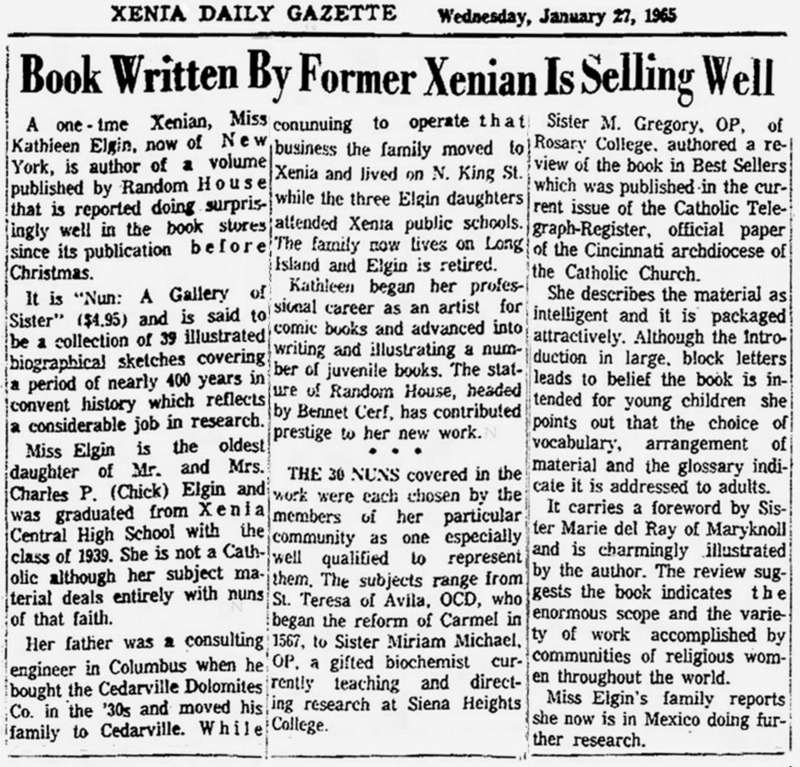 This last book was reviewed by The Xenia Gazette, which included several personal notes on the authoress as a former Xenian, who "began her professional career as an artist for comics books." In 1964 Kathleen Jo Elgin moved to Ocean Bay Park on Fire Island, NY. 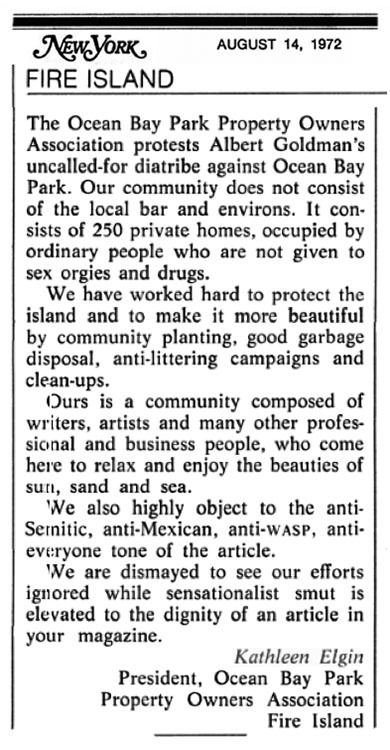 In 1966 she became president of the Ocean Bay Park Property Owners' Association, and campaigned to enforce restrictive limits on noisy vacation renters. 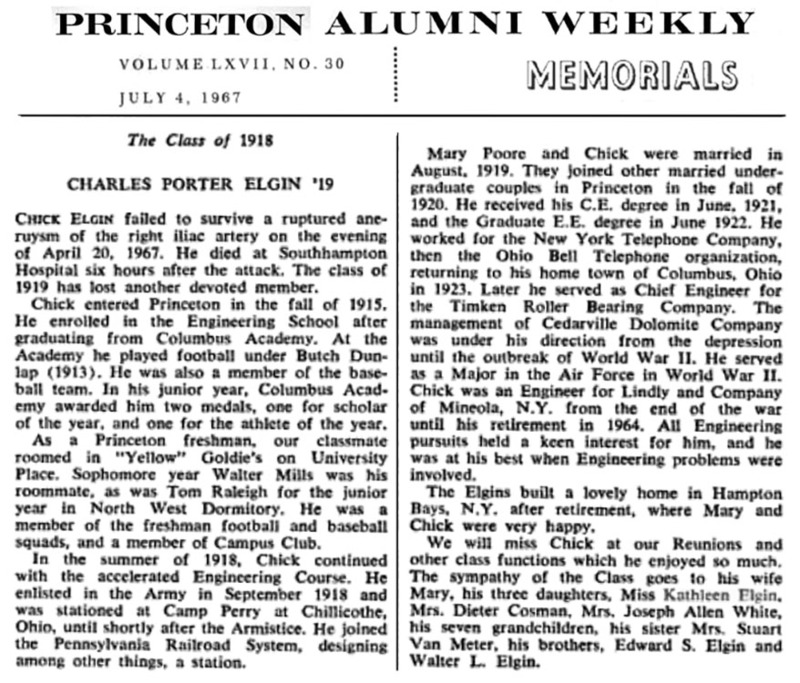 On April 20, 1967 her father, Charles Porter Elgin, died at the age of sixty-nine. An Obituary was published in the Princeton Alumni Weekly News. 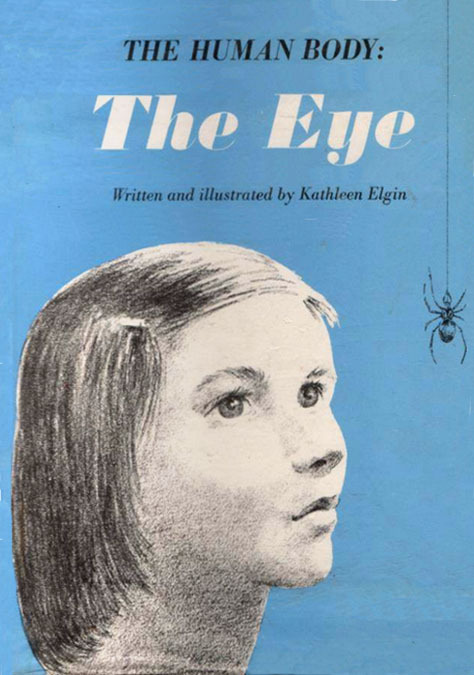 In 1967 Kathleen Elgin began to write and illustrate a series of young adult books about the human body for the Franklin Watts Publishing Company. 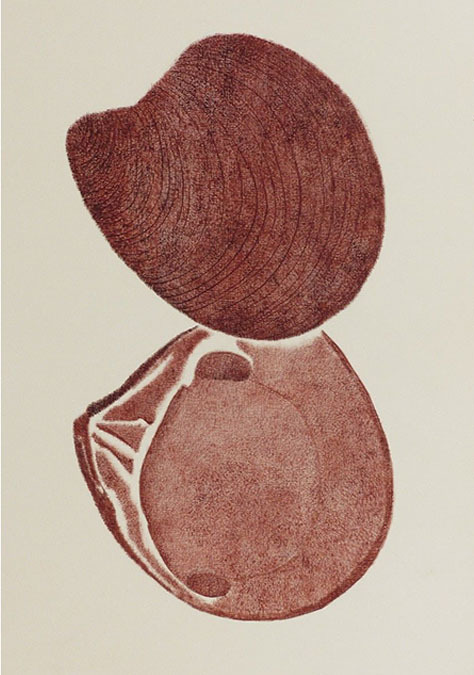 The series included, "The Ear" (1967), "The Brain" (1967), "The Heart" (1968), "The Female Reproductive System" (1969), "The Male Reproductive System" (1969), "The Skin" (1970), "The Respiratory System" (1970), "The Glands" (1971), "The Skeleton" (1971), "The Ups and Downs of Drugs" (1972), "28 Days - Menstruation" (1973), "The Digestive System" (1974), and "The Fall Down & Skin Your Knee Book" (1975). 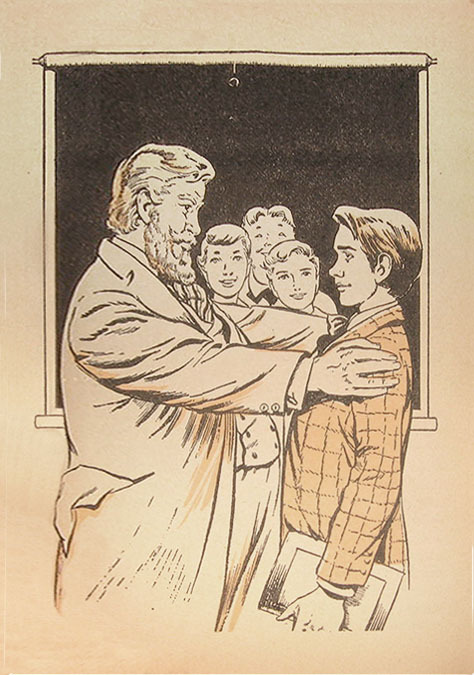 In 1968 David McKay Publishing Company produced a series of children's books on the freedom to worship. Three of these were written and illustrated by Kathleen Elgin, "The Quakers" (1968), "The Mormons" (1969), and "The Unitarians" (1971). On July 24, 1972 New York Magazine published "I Have Seen The Future And It Is Fire Island" by Albert Goldman, which featured the seamier side of the popular vacation community. On August 14, 1972 Kathleen Elgin responded in a defensive Letter To The Editor. In 1975 she retired from illustration, but went on to design and supervise execution of stained glass windows for the Cathedral of St John the Divine in NYC and the Mayo Clinic in Rochester, NY. In 1979 her mother, Mary Leantine (Poore) Elgin died at the age of eighty-one in Hampton Bays, Long Island, NY. After her mother's death Kathleen Jo Elgin sold her home on Fire Island and retired to Key West, Florida, where she lived at 1607 Johnson Street. She volunteered to design graphic logos and illustrated brochures for local charities, and painted posters for the local theater. In 1987 she began a successful relationship with Liz Kern (b. 1938). She was the Executive Director of the Hospice Visiting Nurse Association of the Florida Keys. According to the Key West City Commissioner, Tom Oosterhoudt, "I loved Kathleen because she always had a great sense of humor and loved to laugh." Kathleen Jo Elgin died at the age of eighty-two in Key West, Florida, on January 25, 2005.